How to choose your avalanche backpack ? An avalanche airbag backpack is a backpack equipped with inflatable pouches that increase the volume and surface area of the skier to keep them on the surface of an avalanche if caught. 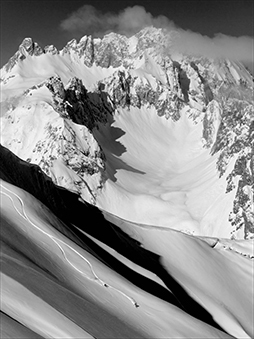 In addition to a transceiver, shovel, and probe, this essential piece of avalanche safety gear has proven itself time and again over many years. To choose the right avalanche airbag backpack for you, there are several elements to consider. How the pack functions, the trigger system, inflation power, shape, the number of airbags and their position, storage volume, as well as weight and carrying comfort. There are two types of avalanche airbag backpacks, those that use a compressed gas canister system and those that use a battery-powered electric system. ARVA chose to develop a system using a compressed gas canister to offer the most reliable system available whatever the environment or weather conditions. Compressed gas canisters have the advantage of providing incredible inflation power and resist even the coldest temperatures. The absence of electronics components in the REACTOR system means greater reliability when experiencing the most extreme conditions the mountains have to offer (cold, humidity, etc.). The REACTOR range of avalanche airbag backpacks is equipped with an activation mechanism that uses a cable linked to a trigger handle that is well positioned and easy to grab. A cable is a reliable and reusable solution when compared to those systems that use small explosives and require replacing the trigger handle whenever the airbag is deployed. When folding up the trigger handle, it locks to avoid any accidental deployment of the airbag, which, for example, is advantageous when traveling. Inflation power should be an important factor to consider when choosing an avalanche airbag system. It is absolutely necessary for the airbag to be able to deploy and inflate quickly even as the incredible forces of an avalanche push against it. Compressed gas canister systems fill 1/3 of the airbag (depending on conditions), or 50L. The Venturi effect, where outside air is sucked into the system, inflates the remaining 2/3. Our powerful Venturi system ensures that the airbags are well inflated even if there are powerful external forces pushing against the airbag as it deploys. According to a study of more than 400 cases of airbag deployment during an avalanche over the last 15 years, in more than 60% of the cases the airbag was deployed only once the person was already caught in the avalanche. This is why it is important for an avalanche airbag backpack to be designed with a powerful Venturi system. The Reactor’s Venturi valve was designed to ensure maximum power (more than any other system on the market) all throughout the airbag’s inflation phase. We even applied for an international patent for our new invention. The number of airbags also increases reliability. Two independent airbags ensures that the system will function even if one of the airbags is punctured or ripped apart. The Reactor system has one airbag separated into two distinct and independent compartments. This ensures maximum reliability. Volume and shape also influence efficiency and performance. The more volume and surface area the airbag provides the more efficient and effective the airbag will be. A stable airbag maintain is position and surface area to enhance float and allow the wearer to stay on top of the avalanche. The shape and attachments for our airbags allow them to spread the volume out over a larger surface area while maintaining stability and protecting the victim’s head from bumps and other impacts.